Although some regions experience mild temperatures throughout the winter months, that doesn’t mean they won’t use central heating when the days get chilly and nights get downright cold. Regardless of how much heating your home requires, you naturally want to save as much money as possible when keeping your home interior comfortable. This is why it’s a good idea to look into energy efficient heating systems and what installing them can do for your home and your budget. Initial costs can be high, but considering what you might save over time, you could recoup costs and then some. You’ll also do your part for the environment through conservation. What can you expect from energy efficient heating installation? There are several upgrades you could make to your HVAC system to improve energy efficiency. If your furnace is a dinosaur that’s on its last legs, it’s probably time to consider a modern upgrade that allows you to enjoy more efficient performance and reduce waste and expense when heating your home. You might even want to consider a heat pump system that can be used for both heating and cooling your home. This type of home heating system is ideal for regions that experience milder temperatures as they can struggle to match the heat output of a furnace when the weather is truly freezing. In merely cool climes, however, they can provide similar performance while delivering incredible savings on heating and cooling costs. You’ll also want to upgrade your thermostat if you don’t yet have a programmable model. This addition to your system allows you to set the temperature for comfort when you’re at home, then automatically roll it back during the hours your family is away at work and school, reducing usage and utility bills in the process. Choosing the right energy efficient heating components for your home requires the assistance of a qualified HVAC service provider that can advise you on available options and seamlessly install your new system when the time comes. You should partner with professionals that are not only adept at installing energy efficient heating, but that also offer ongoing maintenance plans to ensure you get the greatest performance, longevity, and use-value from your upgrades. When you work with an experienced and reliable HVAC company that cares, you’re going to get the best products and services for your home. 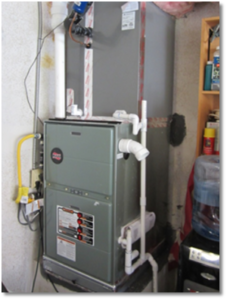 Rowland Air can provide new furnace heating installation services to the Santa Clarita Valley, Antelope Valley, and San Fernando Valley areas. Give us a call today at 800-500-9068.